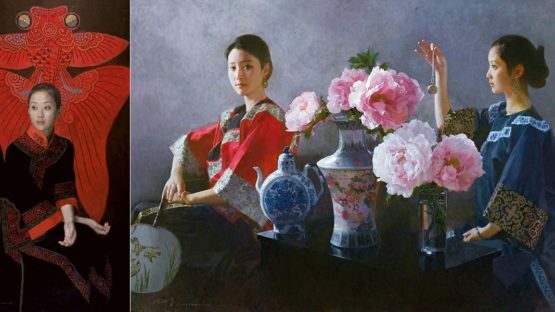 Chen Yanning was one of the contemporary Chinese oil masters best known for his portraits of Chinese women. His works were selected to be included in The Contemporary Oil Paintings from the People’s Republic of China exhibition in New York. Chen Yanning was born in 1945 in Guangzhou, Guangdong province. He attended the Guangzhou Academy of Fine Arts, graduating in 1965 and remained there for further study through 1986. In 1981, Mr. Chen held his first solo exhibition in Singapore . In 1982, his paintings were selected to the Salon Exhibition of France, in Paris, France. He was a professional artist at the Guangdong Painting Institute, a member of the Council of the Chinese Artists’ Association, and a member of the Guangdong Literature and Art Union. In 1987, he accepted an invitation from Robert Hefner to come to the U.S. for the opening of the Harkness House Exhibition. He has remained here ever since, developing an impressive career as a commissioned portrait painter. In 1987 and in 1989, Mr. Chen had two successful one-man shows at the Hefner Galleries in New York, which established his reputation in the United States. In 1988, he graduated from the Oklahoma City University and stayed on campus as an instructor at the Arts Department. His outstanding talent in portraiture won him the national prize in a portraiture competition held in conjunction with the Federation of British Artists in England in 1991. In 1998, Mr. Chen’s paintings were shown in the exhibition: China 5000 Years at the Guggenheim Museum of Art in New York, New York. In 1999, he was commissioned to execute a formal portrait of her highness Queen Elizabeth II in the Buckingham Palace in England. Yanning’s portrait of Queen Elizabeth II was then selected as postage stamp of the Queen’s Golden Jubilee 2002. Chen Yanning has traveled extensively and has been a guest artist in Australia, Brazil, Great Britain, France and the United States, presenting one-man exhibitions in all of these countries. His work has been acquired by major museums including the Chinese National Gallery, the Museum of Chinese History and the West Australian National Gallery. Today, he and his family split their time in New York, Hong Kong, and Los Angeles.